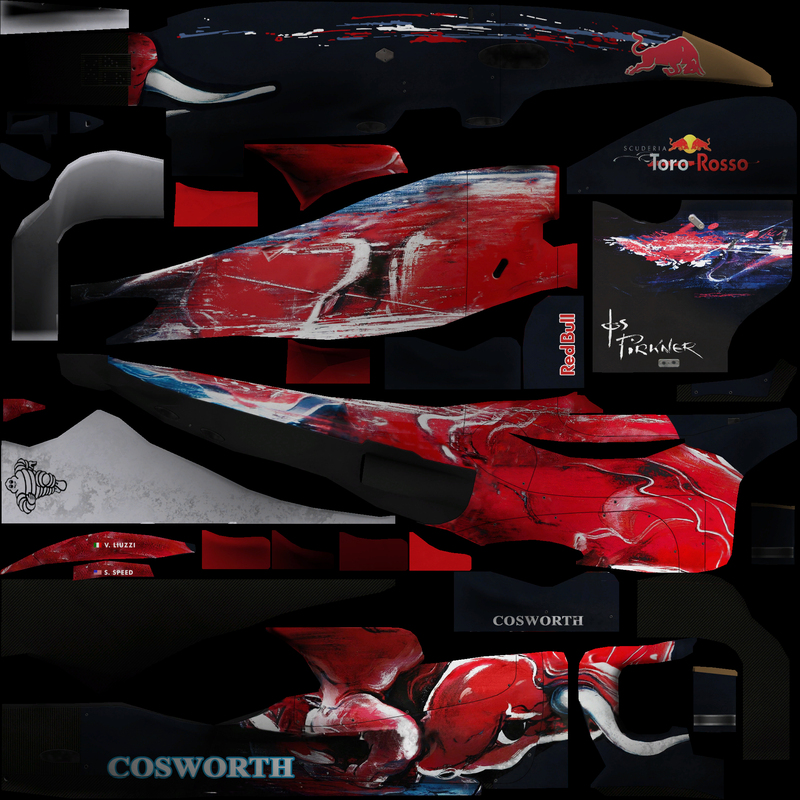 I have been asked nicely and because I liked the idea I proceeded and wrote a little Making-of for the Toro-Rosso livery. I’d like to explain a few things about the way I made it. The car got alot of my intention, because by the time I made it in late 2006 there were very few good STRs done and so I was challenged to recreate the car as authentic and as high-quality as possible. Here is the full story with full-size illustrations. The model was done by Marco ‘BMWFan’ Büttner. The model was based on Redbull 2005, which was based on Jaguar 2004, which was based on 2003. I covered the story elsewhere. Well, I did some modelling on the model as well, to refine it to my likes. I started painting in september 2006. I did alot of research to find good images and see how other painters approached the car. I don’t want to sound arrogant in any way, I spoke with some painters about this, but it didn’t help me at all. Some tried to repaint the bull by hand, some just copy pasted a giant blurry image on the car. It didn’t work for me. I wanted to have something where you can go close-up and don’t regret it. So finding the right technique to do the bull was the key. So it began by taking a look at how the Bull was done in real life. In 2006 it was sprayed on the car. Took several hours, not sure exactly I have the number of 5 hours in my head. This is different to how the bull was done in later years. 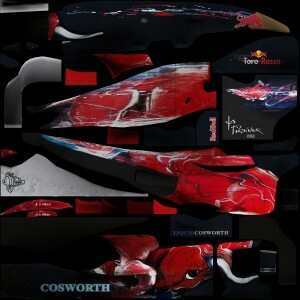 Because of the weight of the paint, the bull-design was changed to a mix of stickers and decals. So while the design was mix of gradients and painted grunge in 2006, it were sleek and descreet lines in 2007. This should be known when taking a look at later Toro-Rosso cars. 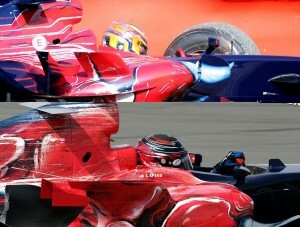 I would paint the 2007 and the 2008 Toro Rosso in a different way, than I did the 2005 one. Here is a comparison between the 2006 bull (bottom) and the 2007 bull(top). So with a sprayed bull, there was no way to reproduce it by hand. 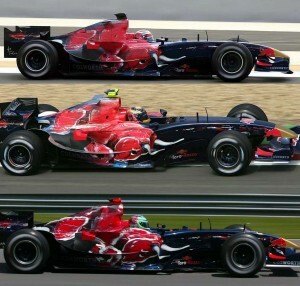 For the 2005 mod, I did the Monaco-Special-Livery for Redbull, which was a flaming Star-Wars-car. recreating the flames didn’t work either, so I began to take sample flames from screenshots and apply them to the texture. It worked ok as a test and prooved to me this method would work. Back then I couldn’t guess, I’d have to do more than one car with this technique. So, how does it work, quite simple. I had my high-resolution pictures and copied large chunks from the pictures to the texture. The bigger the chunk and the higher the resolution the better. I started with the 4 main parts: the face on the sidepod, the horn on the cockpit-sides, the upper sidepod and the forward airbox. From there the tedious work to bridge the gaps began. This was done by taking many many many different images and taking small portions and stitch them together using copy-brush and layer duplication. Using Alpha-channels for single layers was also very handy, so you could remove parts of a layer without actually destroying it. Here is an early shot of the texture, by the way, all shots are in their original resolution and not scaled down. Of course, some problems arose with some areas, which simply weren’t photographed at all so far. I was very lucky to have Andy ‘XPB’ Hone in the Paddock in China and get him to get some shots of the rear end of the bull. Thank you, the car wouldn’t have been the same without him! Still even with this method of recreating, it is clear it’s no carbon copy of the original car. It’s as close as it can be, but there are areas which are slightly improvised. After all we don’t have the blueprints of the cars and pictures aren’t always perfect. However having an accurate model helps alot! The area in the back was one example where I had to consider what to do if there are no images. Ok, I couldn’t check it and so nobody could, but this isn’t very satisfying. So I’m glad that I could avoid such major improvisations. They’d have killed the design. So piece by piece the bull grew and the gaps were closed. I got all the missing parts. I used more than 40 different pictures for the bull and the final source-file had more than 60 layers of bull-pieces and grew to 100mb in size. The regular design and logos were added and the colors were tweaked. The color correction was one thing I didn’t do back on the star-wars livery. So every piece had a slightly different hue and saturation and it looked off. 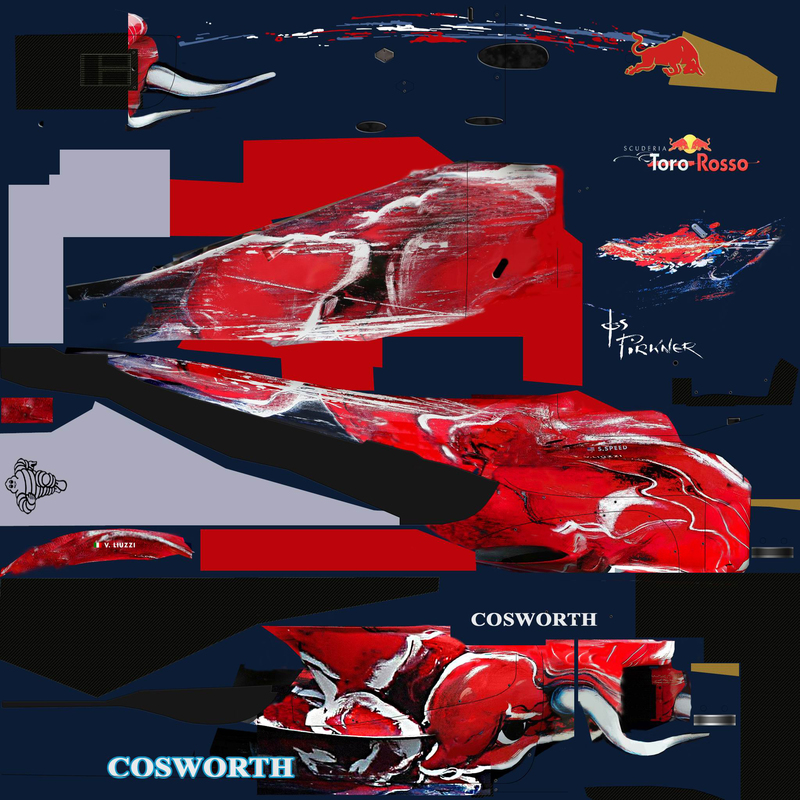 So for the Toro-Rosso I tried to find one proper color and changed the color to fit this. Once everything look like one unit, I did the final color correction. The work wasn’t still over yet. Already during my research I noticed. 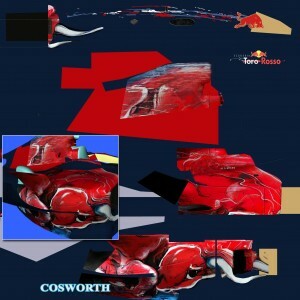 Toro Rosso didn’t run with just one bull, but with 3 variants. The first one was slightly more purple, had less white edges and less “muscles”. In San Marino they introduced the first change on the head and airbox. A major overhaul of the bull came in Canada, where they added many white reliefs and muscles, to give the car more contrast. I also did these variations, which are also additional folders with layers, which can be activated to the regular bull. So for the variants I used the original bull and only replaced, what has been changed. Still alot of work for the Canada-Version. There was a fourth revision of the splashes on the nose in China, which I don’t cover here. All variants are included in the mod. I hope this Making-of was as much entertaining as it was interesting for other modders possibly. I’m open to questions and I’d like to have feedback of this kind of Making-ofs is welcomed and if the length and detail is alright. Thanks for your attention. That’s very impressive Daniel…I have to admit, your Toro Rosso is the best out there! 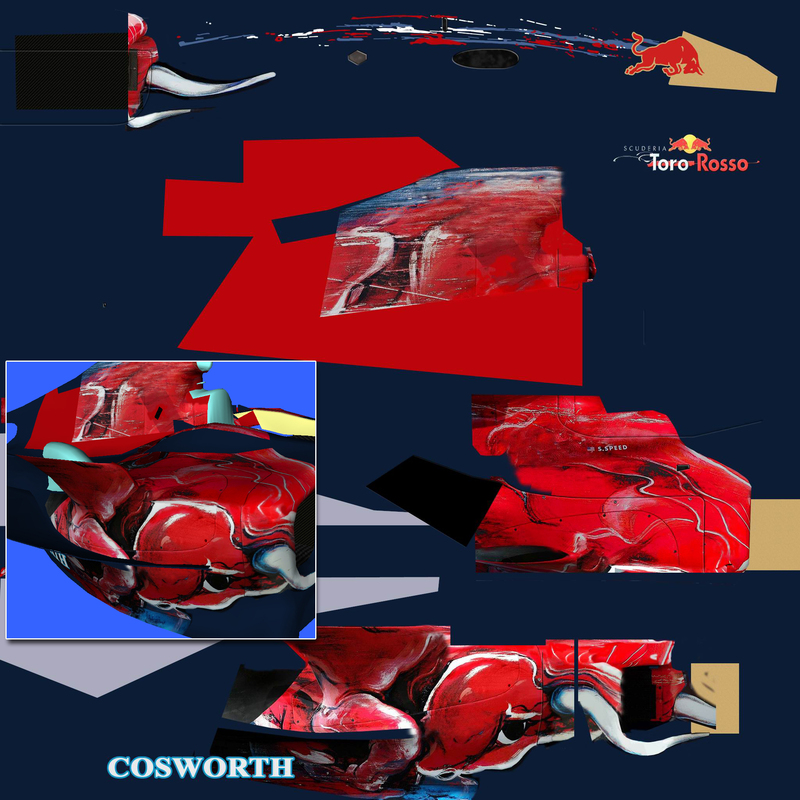 I worked with Ralph Hummerich on the very same Toro Rosso back in 2006…and he did it exactly the same way you did, but what you made of the same car, seems to deserve more credit ! I only know Ralph’s renders, they looked promising and were the best out there at the time. I’m sure if he had released the car, it would have met the expectations. That was a great answer to my question! I must have been difficult to get all parts of the car right, with the same color, the same look and make them match in the 3D model, since they came from different pictures. And the different versions of the car must have been difficult too. But the result is worth it. About the colors, it should be kept in mind, that this is the texture and it was optimised for display ingame on the car. For example, the rendershadows only add shadows, any specular lights and highlights are done ingame by the graphics engine. So this looks quite dark and dull in this respect, but livens up ingame. We just don’t add static highlights on the texture anymore, but use the specular-map to accomplish them. Same with other details like jointlines, which are just 1px black lines on the texture, but get their depth ingame by the normal map. 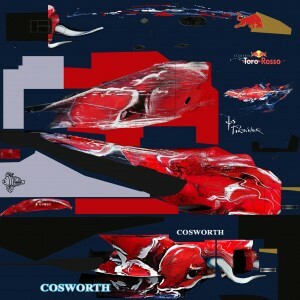 You say we don’t have any blueprints, have you seen any of the F1 yearbooks published by Chronosports? they have sketches of the front, back, side and top of all of the cars aswell as lots of photos. about a year later I got a PDF which was done by STR for press kits. It contained top and sideviews of the car, but the resolution of the bull was too low resolution anway, so I didn’t regret not having it. Usually, when we model the cars, the yearbooks aren’t out yet. Nice car, but 8 MONTHS??! That’s wayy too long dude. Have you seen my schedule. Remember I don’t work 5d/8h a week on the car, only a couple of hours every other week during the semester, so progress is slow.